Leek is an annual, or sometimes perennial, plant; its linear leaves dilate at the bottom into leaf sheaths that surround the stem. The round stem grows from a slightly bulging bulb and is topped by a globular, umbellate cluster of white to light red flowers, with some small bulbs growing among the blossoms. Flowering time is June and July. Another variety: Wild leek or Ramp (A. tricoccum) is strongly onion or leek scented; is similar to cultivated leek. Cherokees ate the leaves for colds, croup, and as a spring tonic. Warm juice of leaves and bulbs used for earaches. Similar to garlic in medicinal uses but less potent. Do not confuse Ramp with the poisonous Lily-of-the-Valley that it resembles. Usually grown by cultivation. Native to the moist woodlands of eastern-to-midwestern North America. The word leek comes from the Anglo-Saxon name for the plant, leac. The leek, like its relatives the onion and garlic, has been known as a food plant for thousands of years. Over 1,200 years before Christ, the Israelites in the Sinai wilderness longed for the leeks, onions, garlic, meat and other foods they had known in Egypt (Numbers 11:4-6). The emperor Nero ate great quantities of leeks under the delusion that they improved his voice. Beginning in antiquity, soldiers of many centuries believed that carrying a leek in battle would assure safety and victory. In the 6th century, St. David, the patron saint of Wales, directed the Welshmen to wear leeks in their caps to identify themselves in their successful battle against Saxon invaders. 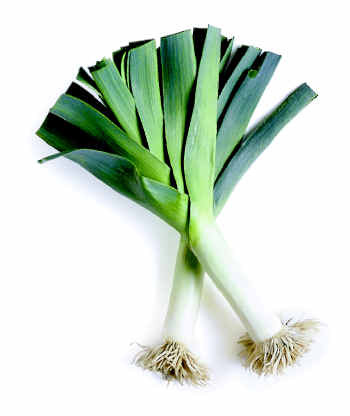 To commemorate the victory, the leek was made the national emblem of Wales. Leek has about the same properties as garlic, but to a lesser degree. It also stimulates appetite and helps to relieve congestion in the respiratory passages. Leek makes a good, non-irritating diuretic. The crushed leaves can be used externally to ease the sting of insect bites. Leeks are good for keeping blood vessels elastic and preventing premature aging. Eating plenty of the Allium varieties, such as chives, garlic, leeks, etc. will result in intestinal worms being eliminated. Eat leeks lightly steamed or fresh in a salad. Do not confuse leek with the poisonous Lily-of-the-Valley that it resembles.